Bedtime Digital Games have announced that they will be bringing their surrealist puzzle-adventure Back To Bed to the Ouya on October 7. If you were being followed by a quadripedal Mr. Tingle wouldn’t YOU keep your eyes closed? That’s right, after successful iOS, non-Ouya Android, and PC releases, Back To Bed is making the leap to the slowly improving Ouya library. Best of all, if you’re into puzzle games, you only have a week to wait: the game comes out on October 7. Being a narcoleptic is hard enough, but being a narcoleptic’s subconscious? That’s downright terrifying. In Back To Bed you take on the role of Subob, the manifestation of Bob’s subconscious desires to Not Die, and proceed to make sure that desire is fulfilled. 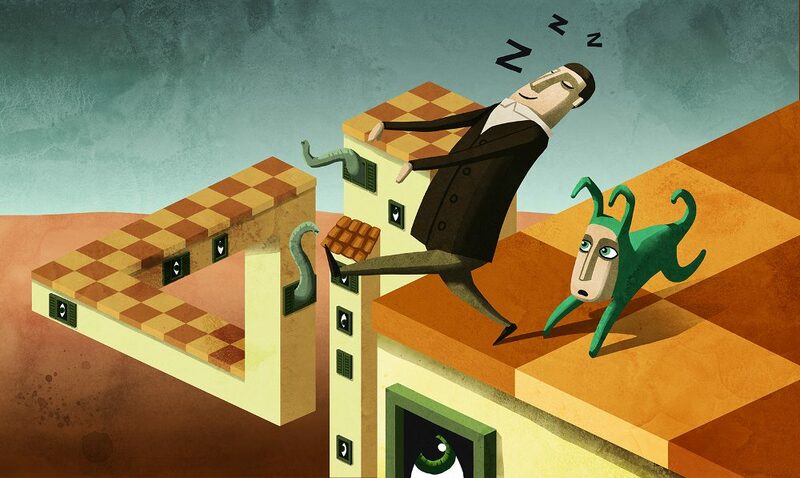 Bob is not only a narcoleptic: Bob is also a rather adventurous sleepwalker. As Subob, you must find ways to prevent Bob from walking into traffic, off ledges, into manholes, and so on. It’s a hazardous life being a sleepwalker, and it’s a tough job being their subconscious. Do you have what it takes to keep Bob alive? Bedtime Digital Games (and never so apt a moniker has a company had) have seen good success with Back To Bed in its previous incarnations, with good critical and public response to the game. Many players and critics have praised the title for its creative use of surrealist imagery and perspective warping to give the game’s puzzles a huge amount of flexibility, a flexibility the designers have taken advantage of to provide players with some very off the wall solutions to Bob’s troubles. The game lies somewhere between Pipe Dream and Lemmings in terms of how the game works; two games that are much loved by old-school puzzle enthusiasts already.